Today I’m going to introduce Google Trends (formally Google Insights), this is a programme developed by Google that shows you average search terms over the last 8 years, it brakes this down into different months, weeks or even days. The benefits of using Google Trends for your milton keynes internet marketing campaign is that it often shows the busiest periods of each industry and helps you understand when to expect the most amount of traffic. 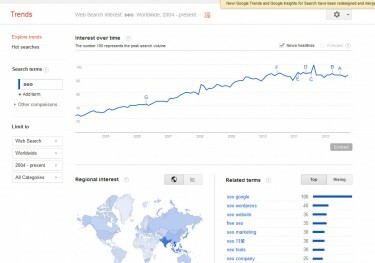 So lets try it out with SEO, below shows the results since 2004 to present day, you can see a huge rise in the amount of people search for SEO in the past few years. This is down to the internet revolution and the amount of people needing there websites to be found on Google and other search engines. 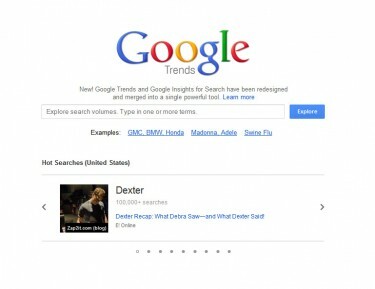 There are many options on Google trends which include location, comparison as well as time and date filters. To help with your online marketing and SEO strategy here are some general trends for not just businesses in Milton Keynes and the surrounding areas but around the country. Depending on the type of business you run the new year can have its benefits, the Christmas period is over and people are looking to spend, a lot of businesses benefit from a ‘new start’ mindset, people have goals and ambitions for the new year which they may need to deal with you to achieve. Google trends often has a short rise for a lot of businesses in the new year, whether it be looking at their marketing budget or planning their strategy for the year. Dependent on the type of business you run the summer can be hit or miss. On one hand people are off enjoying their holidays and not worrying to much about things which is why there is sometimes a short drop in the Google trends results for a lot of business around this time, but on the other hand you may also get business from people having a bit more time in the school holidays. If you provide a service such as tuition or teaching you would likely to see a rise at the end of summer with people looking to start an academic term in September. The Christmas period for many businesses generally shows the largest drop in the year with people not wanting to spend and being focuses on Christmas and spending their money there, however if you are an online store that focuses on the sale of gifts this could end up being your busiest period of the year! We have only touched on Google Trends in this post, if you would like a full marketing review of your business including your busiest periods and a full consultancy then please don’t hesitate to contact us!